This one is rich and creamy and never fails! Preheat oven to 350 degrees. In large mixing bowl add all the cheesecake filling ingredients and mix with a mixer until creamy and smooth. After it's thoroughly mixed, give the batter about one more minute with the mixer to make sure it's creamy and nice. Pour into cheesecake pan and bake for 35 minutes or until the center looks set and SMALL cracks start to appear around the edges. Remove from oven and cool for about 1/2 an hour before putting it in the refrigerator to cool completely. These are the simple ingredients to this "masterpiece" cheesecake. Prepared graham cracker crust, REAL vanilla (I can't stress to you enough how much improved the taste is! 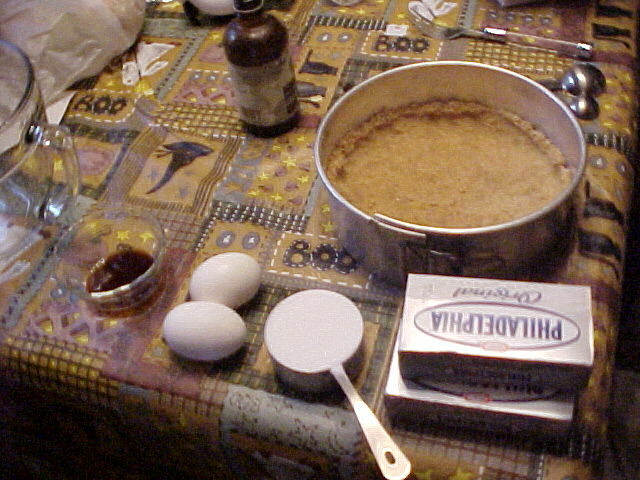 ), eggs, sugar and cream cheese. I have not tried using reduced-fat cream cheese, but a friend has and said it worked out fine. Place the cream cheese, vanilla and eggs in a large mixing bowl and beat with a mixer until thoroughly mixed. This process will be easier if you let the cream cheese sit out and reach room temperature. 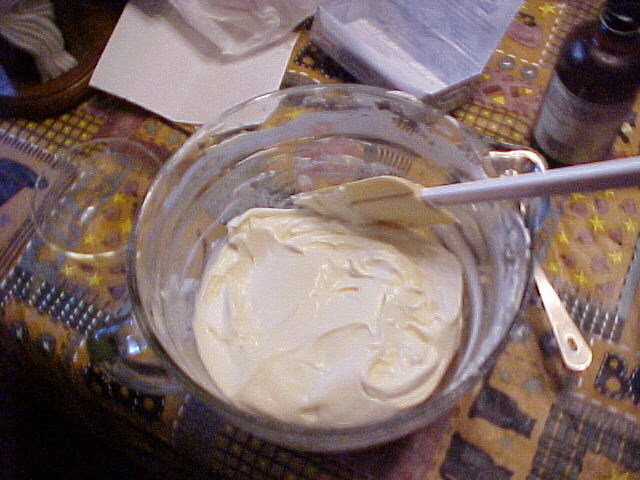 Once thoroughly mixed, whip another minute or so to make sure it's very creamy. 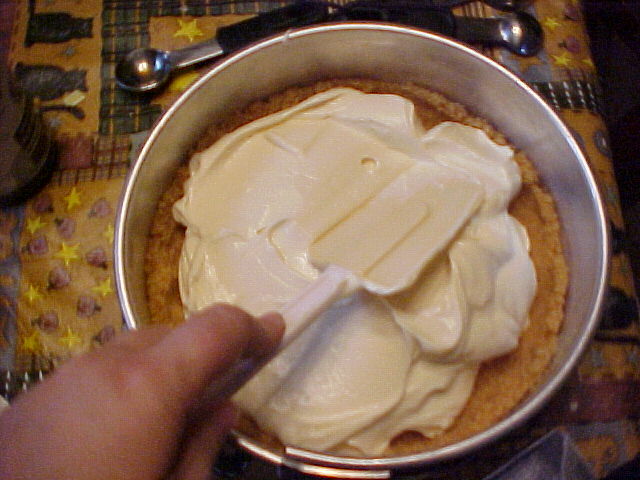 Pour the batter into your cheesecake pan, and spread it gently on top of the crumb crust. Place in 350 degree oven and bake for about 30-35 minutes. 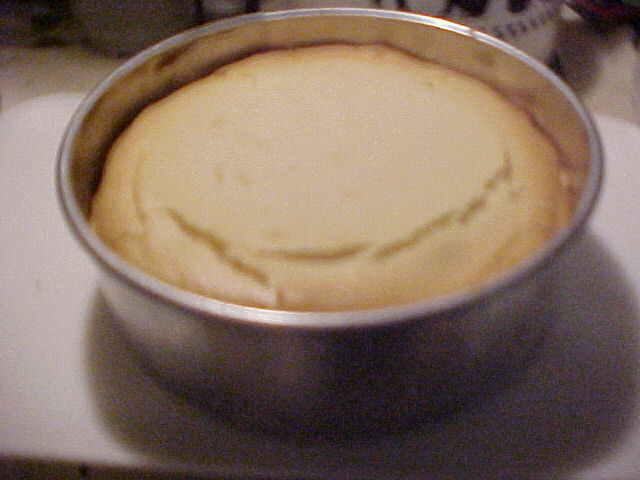 The finished cheese cake should have a few cracks around the edges and will puff up. 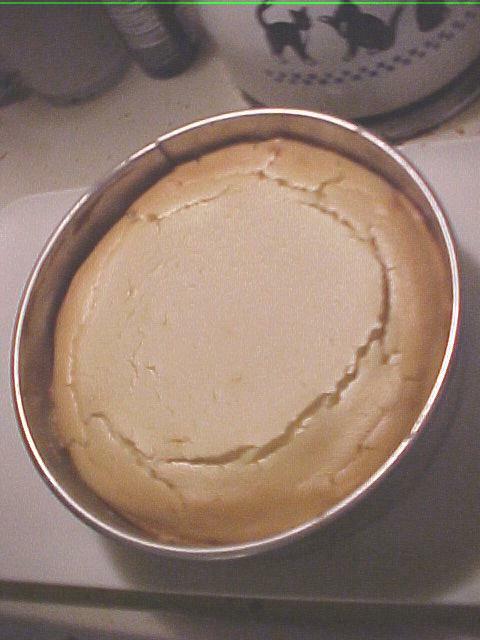 Your cheesecake will look really beautiful when you take it out of the oven, it will be all puffed up and "risen". But I have to warn you, it will probably sink down a little in the center when it cools and this will be just fine. In fact, this will give you just the right surface to put cherries or blueberries if you want them on top. 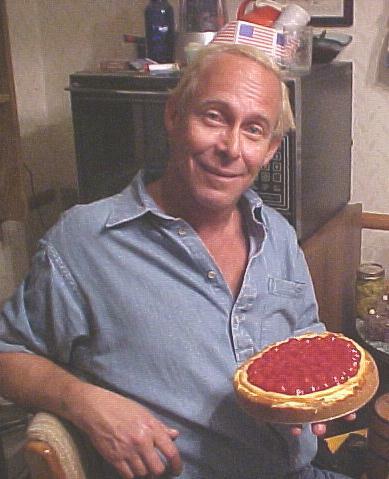 Here's the finished cheesecake -- all dressed up with cherry topping. Add 1/3 C. Cocoa powder and 1/4 C. additional sugar to the cheesecake batter. This is even better with chocolate graham cracker crust. Optional: 10 minutes before baking is completed, top this one with one 8 oz. carton of sour cream, sweetened with 1/4 C. sugar and 1 tsp. REAL vanilla extract. After cooling thoroughly, sprinkle the top with either 1-2 TBS. of chocolate graham cracker crumbs or chocolate shavings. Add 1/2 C. Mini Chocolate chips into the batter. This one is better with chocolate graham crackers, but these decisions are those of the baker -- you can make it how YOU want it! TOPPINGS: Use 1 can of cherry pie filling and pick out the cherries with a teaspoon and arrange the cherries with a small amount of the glaze on your cooled cheesecake. Never just dump it out on the cheesecake -- you will have too much syrupy stuff and it will be too messy. Use 1 can of Blueberry Filling and again, pick out the berries and simply put berries with small amounts of the glaze.